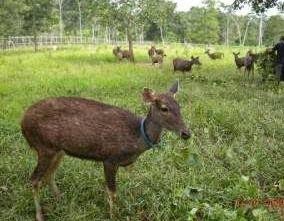 The Deer Cavitation located in the Waru Sub-District Of north Paser Panajam,East Kalimantan Governor Decree No.14/BPN-16/UM-05/III-1990 provide 1,000 hectare of land for breeding areas.How ever until now only used and already fenced area of 50 acres. The breeding established in 1996.The location is the Tanah Grogot Panajam Street[approximately 103 miles from Tanah Grogot]In addition a tourism,this place is also used as a place for breeding and preservation of various types of deer. Deer population recorded in the July 2002 approximately 109.Deer species that are bred are Sambar deer(Cervus Unicolor Brokei)and the Timor deer(Cervus Timorensis).The adult hind,respectively 22 male roedeer and female roedeer. When this has been done in collaboration with Indonesian Institute of sciences (LIPI)in the field Livestock Potential deer. Captive breeding has become a tourist attraction because the deers have scientifically low fat content and a lot of health benefits and is used as a traditional Chinese medicine ranging from horns,tail testicles,to potential from local and export market. Indah banget mas, jadi ingin jalan-jalan di Penajan.